This is a blessed little temple of Baba Sai. Please follow the basic guidelines and keep this temple neat and clean. Respect your fellow devotees and please don’t engage in unnecessary arguments. Remember you are here for Baba only. You cannot post asking for any financial help for any purpose. And being a member of this Forum, it’s your moral responsibility to report such post to ADMIN. You should not post your personal email id and phone numbers. You may end receiving fraudulent calls and your email inbox will be spammed. Let us post our posts only in relevant sections. Choose the Forum Section that is closest to your post, and place it there only. If you should create a post in one forum, and later realize it would be more appropriate in another forum, please delete the original before posting it again. Let us not reply a meaningful post by just saying "Om Sai Ram". Let us resolve to post a suitable reply if we wish to. Sai Baba wants us to see our sincerity in bhakti and so let us not do any copy and paste of nam jaap or any other mantra. Baba wants to see the devotion and so if we type nam jaap or any mantra even once it is fruitful. Let us type and not do copy paste. Let us resolve to do "Naam Jaap" only in suitable sections and not to do this in other sections. Let us resolve that if we are quoting other authors or scriptures, we give the source of the author or book always. Baba again sees the sincerity of approach and not show off. A humble seeker is closer to Baba than a person showing off his borrowed knowledge. Spamming is strictly not allowed. If you have a good website, please post about the same as a separate topic but do not repeat the same post in several boards. Website links are not allowed in signature. How can you help Forum? This Forum is like a temple where you get lots of positive energy. Why not start your work or day by visiting this Temple, do the naam jaap and read a little story or devotee’s experience. You can browse hundreds of stories, experiences, poems and articles. If you recently came across a very good article and you think it might help others, please share with us and do not forget to acknowledge the author/ blog. If you have good appetite for discussion on spiritual topics, this is just the right place. These discussions are meant for bringing one to closer to God. Please use them in a positive way. Group prayers are very powerful. Trust me they can do wonders. May devotees request for prayers. Your little prayer can do wonders. If you get a moment, spare a prayer for them. 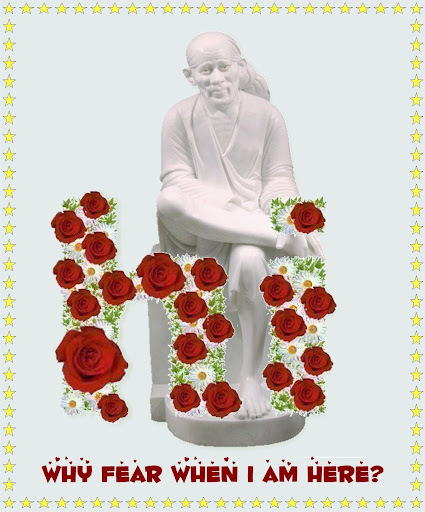 And if you love this blessed temple of Baba Sai, let your friends, colleagues, relatives know. God places the heaviest burden on those who can carry its weight. Baba blessing. To change your name in the forum you need to request our forum Adiministrator. Onlyhe will be able to assist you. Leave a message fpor him. He willdo the need.